The Mercedes-Benz Superdome is home to the NFL champion New Orleans Saints. The Mercedes-Benz Superdome is located in the city's central business district. The Smoothie King Center is an multi-purpose indoor arena that is home to the NBA New Orleans Pelicans basketball team. Every year, these elegant, modern complexes hosts a wide range of events, from pro football games, pro basketball games to mega pop concerts. Le Pavillon Hotel, close to both the Mercedes-Benz Superdome and Smoothie King Center, is the perfect choice for visitors who wish to attend an event or game at this magnetic, awe-inspiring structure. The Mercedes-Benz Superdome website has the latest calendar of events, and includes information about New Orleans Saints home games, plus special annual happenings like music festivals and trade shows, which occur in the stadium. Tickets are also for sale through the Ticketmaster portal. Where can I park at the Superdome? There are 7,000 parking spots in 7 garages and 2 surface lots around the Mercedes-Benz Superdome. Be sure to check ahead of your event for specific parking policies. Only cash is accepted at these lots and garages. The Smoothie King Center website has the latest calendar of events, and includes information about New Orleans Pelicans home games, plus special annual happenings like music festivals and trade shows, which occur in the arena. Tickets are also for sale through the Ticketmaster portal. Where Can I Park At The Smoothie King Center? 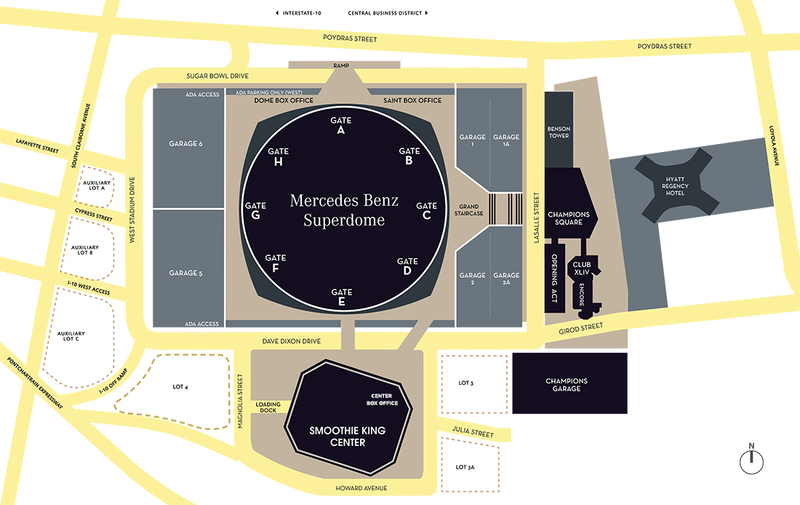 There are 7,000 parking spots in 7 garages and 2 surface lots around the Mercedes-Benz Superdome. The parking garages and surface lots are adjacent to the Mercedes-Benz Superdome and the Smoothie King Center. The public parking garages are designated #1, #1A, #2, #2A, #5, #6 and Champions Garage. The surface lots are designated as Lot 3 and Lot 4. Be sure to check ahead of your event for specific parking policies. Only cash is accepted at these lots and garages.